The troops will be working as part of the United Nations alongside Finnish and Estonian troops. 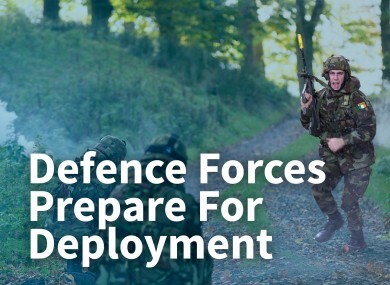 DEFENCE FORCES TROOPS from the 109th Infantry Battalion are putting the final touches on their training ahead of deployment to South Lebanon next month. The troops will be working as part of the United Nations Interim Force in Lebanon (UNIFIL), Ireland’s largest current overseas deployment, alongside Finnish and Estonian troops. In the clip above, the troops simulated having to dismount from an armoured patrol after noticing suspicious activity in the treeline. After checking each vehicle, they moved forward on foot, but came under fire while one troop carrier was hit by an IED. The troops hitched up the armoured personal carrier to another and sped off to safety. Irish peacekeepers were first deployed to Lebanon in 1978, and this deployment will bring the number of troops working with UNIFIL to 370. Email “A mock firefight and IED blast: Irish soldiers prepare for Lebanon”. Feedback on “A mock firefight and IED blast: Irish soldiers prepare for Lebanon”.